Next Insurance debuted in 2016 as a digital insurance agency for small to medium-size businesses. Today, the California startup officially announces its new status as a licensed insurance carrier, starting with Delaware. As a carrier, it will now write policies independently, with greater freedom over underwriting, setting and configuring of policies, and more. In its new capacity, Next Insurance is touting the change as a way to boost the level of innovation in the small business insurance market, with bells and whistles such as on-demand coverage, more sophisticated uses of AI and machine learning for underwriting, and easier policy language. 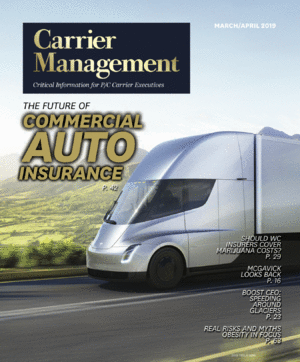 Carrier Management submitted a series of questions via email to Next Insurance CEO and co-Founder Guy Goldstein, asking about the company’s new status and why the change was made. Highlights of his answers are below. Q: Why take this step? Were existing partnerships with insurers and reinsurers not working well? What will happen to the existing partnerships? Will Munich Re still be providing reinsurance support, for example? How will Next Insurance work with Markel going forward? Goldstein: Small business insurance was stagnant for many years. We are rebuilding it from the ground up with new, fresh and innovative thinking. As a carrier, we are developing the insurance product, claims management process, customer experience and more. This step is key in achieving our mission of delivering simple, affordable and tailored insurance for every entrepreneur. Our relations with Markel and Munich Re are very strong, and as a carrier, we will continue to work closely with them. They are more critical than ever before to our future success. Q: Other InsurTechs decide to go the MGA route rather than becoming fully licensed insurers. Did you consider this? If so, why did you decide to become an insurance company instead? Goldstein: Until now, we have been operating as an MGA, which was a step on our path toward becoming a carrier. As a carrier, we want to be able to take some of the risk of insurance upon ourselves and to be able to offer fully tailored products to entrepreneurs. This will allow us to better control the holistic experience and to continue to innovate faster. Q: How are you accomplishing this? Have you purchased a shell company with insurance licenses? If not, where and how are you setting up the insurer? Goldstein: We have not purchased a shell company and are undertaking the work to be a fully licensed carrier in all 50 states. Q: Why Delaware? Beyond Delaware, in how many states do you expect to be licensed? Goldstein: We expect to be licensed in several states by the end of 2018 and eventually all 50 states. We chose Delaware as our first state, as the Department of Insurance is known for their interest in innovation and leading the insurance industry forward. We have found them to be a tremendous partner. Q: In the past, we have heard InsurTech executives talk about the headaches—and costs—associated with becoming a full-stack insurer and the problems of dealing with 50 state regulators. What has been the biggest challenge for Next as the company leaps from being an online agency to become a fully licensed insurer? Do the benefits outweigh the costs? Goldstein: The benefits for our customers are greater than the costs to us as a company. Offering a high-quality product to the market and making sure our customers have the coverage they need is our main goal, and we see becoming a carrier as a way for us to deliver more value to them. There are certainly challenges to being licensed in all 50 states, but our belief is that challenges and opportunities are two sides of the same coin. State regulators are very open to innovation and are looking for better ways to serve small businesses in their states, so the relationship with us is a natural fit. Q: We ran a series of articles about the early financial results of three full-stack insurers in the personal lines space—Lemonade, Root and Metromile—which showed that all had combined ratios well in excess of 100 last year. In other words, none of them made an underwriting profit. Do you believe that your experience as a startup insurer will be different? If so, what factors will allow Next to get to an underwriting profit more quickly? Or will you measure success by some other financial or nonfinancial metric? Goldstein: We are investing significant resources in our underwriting processes and so far are seeing positive signs. We are confident that as a carrier we will be better able to optimize these processes and improve our outcomes. We are building a sustainable company that’s focused on long-term success. We know that in order to do that, we have to maintain our target loss ratio. That’s why we are investing in our rating and underwriting and using data science in innovative ways that have never been done before in the small business insurance market. Q: Do you think that other InsurTechs in the small commercial space will follow your lead—move to become full insurers as well? Why or why not? Goldstein: It is a real challenge to become a carrier and requires significant effort and financial backing. It has taken us more than two years to get to this point. Other companies may have different goals than we do, leading to alternative strategic directions. There’s more than one way to be a successful InsurTech company. Q: The media announcement describes Next Insurance as “the leading digital insurance company for small businesses.” Who do you view as your competitors, and how is Next ahead of them? In other words, what other digital insurance companies for small business do you measure yourself against? What is your competitive advantage? Goldstein: There is room for more than one innovative company, and we believe that new ideas benefit all of us. We all learn from each other, and we welcome competition in the interest of better serving small businesses. We remain focused on delivering phenomenal service for our customers. We offer simple products that are easy to understand and can be purchased 100 percent online, instantly. We are affordable—in some cases, customers have saved hundreds of dollars—and our policies are tailored to each type of business, getting rid of exclusions and offering insurance designed specifically for each type of professional. Q: Can you give an example of a product or pricing innovation for a specific type of small business that existing carriers or reinsurers shied away from—that you couldn’t get from existing carriers? What changes in existing products are incumbent insurers unwilling to make, which forced Next Insurance to go the route of forming an independent insurance company? Was it a product tailoring issue or a pricing issue? Goldstein: We are innovating in coverage, underwriting and the overall experience. We tailor our policies for each one of the types of businesses we serve—this is not something traditional carriers do. An electrician needs different coverage than a plumber, and we offer that, with all policies underwritten 100 percent online. For several types of businesses, we are the only online solution in the United States, reaching out to underserved small business sectors. We have built a customer portal that enables customers to manage their insurance online, and we were the first to launch live, verifiable certificates of insurance. As a carrier, we are able to move more quickly to meet the market’s changing demands—creating policies to meet the needs of today’s entrepreneurs and simplifying the policy purchasing process by asking far fewer questions. Being a carrier also enables us to utilize a tailored, risk-based pricing model, which will reduce prices for low-risk customers. Q: Are there other changes on the horizon for Next Insurance that you would like to share? Goldstein: We plan to dramatically expand our offering for new types of businesses, in addition to the ones we already launched this year, including insurance policies for general contractors, roofers, beauty professionals and more. In addition, we are planning to extend our support for new lines of business. As part of our dedication to innovation, we will be rolling out new features such as on-demand insurance and an improved claims management process.